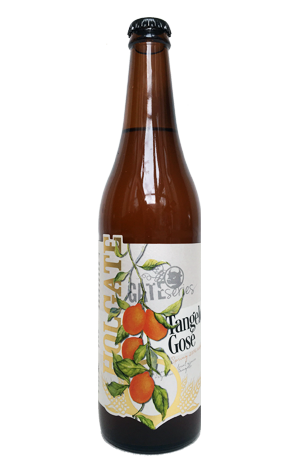 Holgate is the latest local brewer to dabble its toes in gose, with this tangelo'd affair its Spring seasonal release. It comes out around the same time that Nomad has popped its Freshie gose into cans and not long after Sailors Grave launched with Down She Gose as its first release. Indeed, such is the growing interest in the once almost forgotten salty, slightly sour German style that we'd asked our resident beer scholar to pen an article on gose only to discover that, as one of the brewers at Holgate, he was in the process of brewing this one. His article will appear soon (once we've written the other half of it); in the meantime, what of the Tangelo Gose he's been involved in? On the outside, it's quite beautifully presented – a decorative label that's embossed, textured, gilded, you name it. And, on the inside, it's a beer screaming out for the weather gods to make up their minds and let the sun beat down. The organic tangelos supply subtle citrus aromas alongside the saltiness, while Lactobacillus delivers a soft cleansing acidity (and a touch of backend funk) in tandem with some light biscuity sweetness. Very easy-drinking, at least for those willing to deviate from the straight and narrow.